Neomartyr Theodore was born in the village of Ophrynion (Erenkoy) in the Hellespont (Dardanelles) province. His parents George and Kyriaki raised him in a pious Orthodox Christian home. At a young age he went to nearby Tsanak Kale, where he apprenticed in the trade of being a sesame merchant. Later he left the merchant and opened his own sesame business. When Theodore was 20 years old a Turkish man took notice of him, in particular his handsome features, virtuous character and business acumen, and he began a plot to convert him to Islam in order to get him to marry his daughter, who was his only child, and make him an heir of his own wealth. One day Theodore was ill with a fever, and the Turkish man said to him: "Theodore, promise me that you will become a Muslim and I will cure you of your illness, because I like you and wish you to become my son-in-law and the heir to all I have." Although the wealthy Turkish man persisted, Theodore responded by saying: "Please leave me alone, for I was born a Christian as were my parents, and all my relatives. I will not become a Muslim and I don't need your riches, your marriage or your cure, because Christ whom we Christians worship is omnipotent and can cure me, as can the Panagia, His mother, who grant me my health when they consider it beneficial to my soul." Theodore's fever continued, and the Turkish man again visited him. The Turk decided to prepare and give the remedy to Theodore, and indeed it was effective. When the Turkish man visited Theodore again, he saw him healthy and said to him: "See, I cured you. Come now, you must become a Muslim as you promised." To this Theodore replied: "I will not become a Muslim, nor did I ever promise to become one, nor will I. Just leave me alone." This disappointed the Turkish man, who then went to the judge and slandered Theodore saying that he had promised to become a Muslim in return for a cure, but now refused to fulfill his promise. The judge asked for witnesses, and the Turkish man was able to convince other Turks to bear false witness on his behalf. The judge therefore ordered Theodore to go to court, where he was asked if the charges were true. Theodore replied: "Yes, I was ill and was cured, but I never promised to become a Muslim., nor did I ever give my word on this. Those who say otherwise are lying." The judge responded: "From the testimony of these good and honorable men, it is evident you promised and in fact said that our faith is better than yours. So receive this man's daughter as your wife and become heir to his fortune, since he has no other children. Know also that if you do not listen to what I have advised you to do, you will suffer torture and in the end be put to death." To this Theodore said: "I was born a Christian and a Christian I will die. I will not become a Muslim and I want neither riches nor a wife. I say again, I was and am a Christian, and I will not accept your filthy religion. Do to me what you will." With this bold confession, Theodore was locked up and deprived of food, water and Christian visitors. Only Muslims were permitted to visit him, and when they did they would not cease to try to persuade him to convert to Islam and save himself. When Theodore refused, they took turns beating him. They also later cut at his flesh with razors and pulled out the nails from his hands and feet. Through all this Theodore remained firm and strong in his faith and courage, and was comforted by the apostolic passage: "Who shall separate us from the love of Christ? Shall tribulation, or distress, or persecution, or famine, or nakedness, or peril, or sword?" (Rom. 8:35). One Orthodox Christian priest was informed of the plight of Theodore and managed to be able to visit him in prison, where he gave him consolation and hope. When the priest asked if he had been fed, Theodore said: "No Father, no one has given me bread, or water, or light, but each day a light enters my cell and illuminates it, and it also nourishes me. Therefore I don't need any bread or water. Only those Christ-haters come often and annoy me with their offers, and threats, urging me to become a Muslim, and because I will not fulfill their wish, they torture me." The priest then heard Theodore's confession, communed him, and told him stories of the lives of previous martyrs who died for their faith in Christ to strengthen him in his resolve to fulfill his martyrdom. Seeing that all these things did nothing to change Theodore's mind, the judge had him thrown in a pit of lime where he was kept for three days. He was then bound hand and foot and placed on a horse and paraded all over the city. As he went by, some Turks took the opportunity to strike him with sticks and rods, while others shouted obscenities at him. Unable to break the resolve of young Theodore, the judge sentenced him to death by decapitation. He was taken to the area where the foreign consulates were located, but just as he was about to be bound and his face covered Theodore said to the executioner: "Don't bind me. I surrender myself to death voluntarily for my Christ. Why tie me? Only please allow me a little time to pray to my God." Then Theodore faced east, and prayed and glorified God. Then he voluntarily lowered his head for the executioner, and the executioner struck off his head. This took place on August 2, 1690 at 3:00 PM. Among those in attendance at the execution were Orthodox Christians, Westerners and Armenians, who dipped pieces of cloth in Theodore's blood to keep as a blessing and source of grace. After three days the body was released to the Orthodox Christians, who buried him with full honors in the courtyard of a church. By 1773 the Christians had enlarged the church where Theodore's relics were kept, but because of the Russo-Turkish War at the time the Turks took their revenge on the Orthodox Christians and burned the church down. Theodore's relics however were unharmed. In 1922, with the exchange of populations between Turkey and Greece, Theodore's skull was brought to Greece by Father Konstantinos Oikonomou who deposited them in the Church of Saint Xene in Nicaea of Piraeus, Greece. Rejoice, divine offspring of Ophrynion, and sacred ornament of the Dardanelles, who rejoice, Theodore, that by your contests, you have received a wealth of gifts from God. Rejoice, Neomartyr of Jesus, blessed Theodore, who contested with a firm mind, and as a sacrifice you were offered to the Lord, worthily were you glorified, with mighty glory. 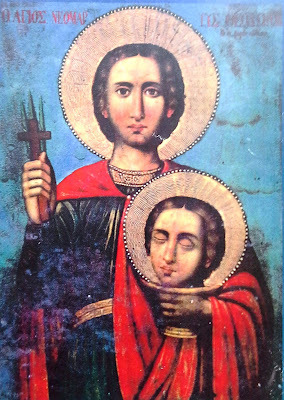 You have boldness before Christ, O Theodore Martyr, entreat earnestly, on behalf of those who honor, your all-revered memory, and venerate with faith, your divine skull.